Every good scout knows to be prepared. If you haven’t done so already, it’s time to prepare your bee hives for cold weather. Feed your bees if they need it, and give them a chance to build up supplies to get through the winter. September is the month you should have started preparing your bee hives for winter…but it’s not too late! Depending on the type of hive you have, you may want to use a feeder that the bees can get to inside the hive. Langstroth hives have several options for feeding. One of the nicest is the divider board, which allows the bees to access the syrup from inside the hive. There are also top feeders and entrance feeders. The main thing is to have a feeder that can be protected from robber bees. Also, a feeder that prevents your bees from drowning as they try to get to the food source. Remember that you can feed as long as they are taking in the food supply. Take a look at where the hive is located. Is it protected from wind? A few bales of hay can help out with building an inexpensive wind block. Also, tilt the hive about one inch forward to help in draining off rain and snow melt. Do not try and harvest honey if this is the first year for the colony. Be sure that they have plenty of stores for cold weather. October is also a good time to plan for next year. Apiaries will start taking orders for packages and NUC’s for next year. A package is three pounds of bees along with a mated queen. That comes out to around 10,000 to 12,000 bees. A Nuc, or nucleus colonies, are small honey bee colonies created from larger colonies. The nuc may or may not have a queen , but will have eggs that can be used to create a queen. The nice thing about a nuc is the colony is already set up and ready to go. 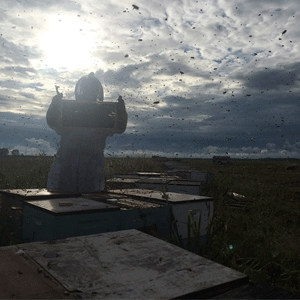 A nuc is often made to prevent swarming by removing frames in larger colonies that contain queen-cells. By removing these cells, it helps prevent the tendency to swarm and divide the colony. Consider putting on an excluder on the entrance of the hive to keep mice out. It is a devise that is just big enough to allow a bee to go through the hole, but it is too small for pest like mice. If you are new to keeping bees, this is also a great time to start looking around for bee keeping classes. They are generally held in the winter months, so contact your local bee association or local extension agent to find out class schedules. Be prepared: keep your bees healthy; fed as needed; hives dry; and, out of the wind. The bees will not only reward you with honey, but will pollinate your vegetables and flowers. 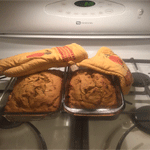 I have prepared many loaves of sweet bread over the years…pumpkin, banana, blueberry, apple and zucchini to name a few. They were all delicious. And…quite sweet. Most of these recipes call for nearly two cups of sugar, either brown or granulated, or both. So, when I saw a recipe for honey pumpkin bread on the website honey.com, I was intrigued. Honey is the only sweetener used in this recipe. 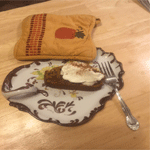 Warning: If you like your pumpkin bread to be really sweet, this is not the recipe for you. However, if you want a tasty alternative using only honey as a sweetener… no sugar added, with the lovely flavor of spices, pumpkin and honey, give this a try! Preheat oven to 350 degrees. Grease or spray with vegetable oil spray, two 9x5x3 inch loaf pans. Cream softened butter and honey. 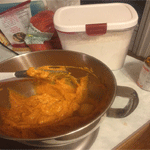 Add the canned pumpkin and mix. Mix in eggs, one at a time, until well-incorporated. 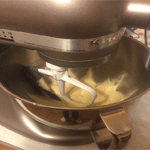 Sift dry ingredients together and stir into the above mixture. Mix well. Stir in walnuts, if desired. 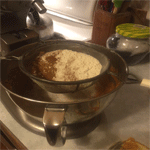 Divide batter equally into two loaf pans. Place in preheated oven and bake for 45 minutes to an hour. Insert knife into loaf near the end of the baking time. If it comes out clean, the loaf is done. Allow loaves to cool about 10 minutes in the loaf pans, then take them out of the pans and cool on a wire rack. Cut bread into 2 inch slices, and serve with whipped cream sprinkled with cinnamon, if desired. Flottum, Kim. The Backyard Beekeeper: An Absolute Beginner’s Guide to Keeping Bees in Your Yard and Garden. N.p. : n.p., n.d. Print. “Seasonal Cycles of Activities in Colonies.” MAAREC Mid Atlantic Apiculture Research Extension Consortium RSS. N.p., 07 June 2010. Web. 05 Oct. 2015. “USDA.” – Beesource Beekeeping. N.p., n.d. Web. 05 Oct. 2015. “Nuc.” Wikipedia. Wikimedia Foundation, n.d. Web. 11 Oct. 2016.